I purchased 8 1x2 boards from the local lumber yard, jute twine, small eye bolts and screws. I recently shared how I built our raised garden beds and I knew that I wanted to attach my trellis to the garden beds. So the first thing I did was pre-drill holes in the 1x2. I chose to build my trellis on the outside of the raised garden bed so that the boards weren't stuck down in the dirt and it also made it easier to see where I was screwing the boards in. I was creating an X figure on the sides of the garden beds so I screwed four screws into the bed to hold the trellis. I did this on each corner of the bed to create an X on each corner. Then I screwed the X together at the top just under the board that runs across the top. The image above shows the basic design of what I had built. I wanted it to be very secure so I took two more 1x2 boards and screwed them on the bottom of the trellis just in front of the tomato plants. I also screwed screws through the top board where the X formed so that the top part of the trellis board was secure. I then took small eye bolts and screwed on into the 1x2 board just next to each tomato plant. I have 3ft x 6ft beds and so I have eight tomato plants in one bed. Then I took four eye bolts and screwed them into the 1x2 board that is running across the top of the trellis. I put the eye bolt between where the tomatoes were located. Then I use the jute twine to create the string trellis for the tomatoes to grow on. I left the jute twine on the roll and unrolled a very long piece. Then starting at the very end corner on the bottom, I stuck the jute twine through the eye bolt. 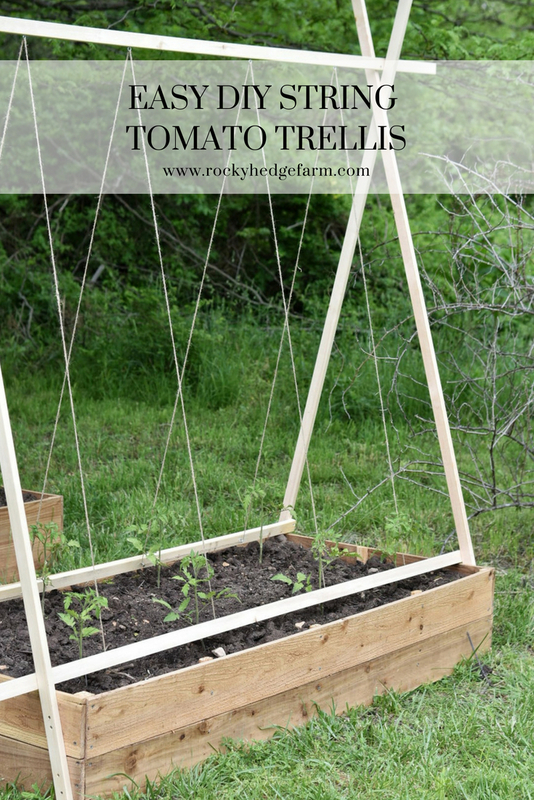 Then go straight up and loop the twine through eye bolt on the top of the trellis. Then go straight down to the next eye bolt, then go through the eye bolt right next to it before going to the second eye bolt on the top. I continued this pattern until I had looped the jute string through every eye bolt. Once I got to the end I tied knots in the string and then cut the twine. I did this on both ends of the jute twine. When I was finished each tomato had jute twine next to it. As the tomatoes grow, I will simply help them climb up the string trellis by wrapping the stem around the twine in a few places. I am hoping that you can understant these directions and that you have been inspired to make your own trellis. This is much sturdier than any tomato cage and I am hoping that I can use is for several years to come.